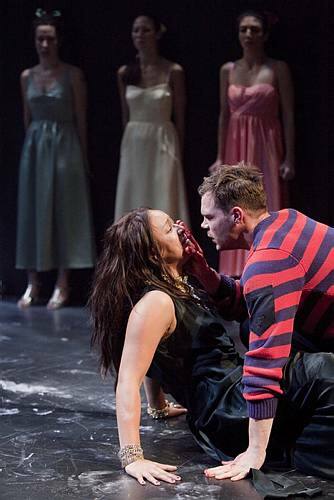 Sydney Theatre Company presents the Residents in ORESTEIA by Aeschylus. In a new adaptation by Tom Wright at the Wharf 1. To this end, then, Mr Wright and his Designer, Alice Babidge, give us a contemporary setting. This play is also now Freud’s contemporary world crucible. A non-descript dirty, black floor space backed by a black wall with a set of three elevators doors, which serve as entrance and exits for the characters. They are also used to reveal the bloody goings on in this dreadful family. The doors imprinted with bloody handprints and then smeared theatrically over the opaque glass, and opening to reveal sculptured arrangements of abused bodies, dripping blood. Just why there are three sets of doors and where the elevators travel to, upwards or downwards, to what must be floors of Hammer House of Horror proportions, (images of Kubrick’s THE SHINING, kept surfacing) becomes a point of distracted speculation during this performance, that sometimes allows the consciousness to drift away from the action unfolding on the stage. The clothing of the present time, hoodies, underwear dresses, jeans, t shirts, sneakers, bare feet etc – an almost brand image now of the Babidge vision, speaks to us, that this work is of the present time, of our friends and families. No Kings or Queens, no war lords or warriors, no gods or furies here, just the casually dressed corporate or professional head or bling decorated female government figure, the next door cross dresser, the boy or girl in the other next door. (Whatever the project era: THE WAR OF THE ROSES, THE WOMEN OF TROY, THE LOST ECHO, THE MYSTERIES: GENESIS , contemporary grunge is the look (check out Vice Magazine link in review for HOLE IN THE WALL). Ms Babidge finds this the solution to the story telling she is responsible for. It is becoming a little too predictable and unimaginative. Good god she must be bored with it because my friends and I are. We have a gamble on it – The vodka and tonics are delicious). This look reduces this core cultural text to the basic role of the actor : to story telling. Unadorned just tell us. The brunt of the task is handed to the actors. The sound (Max Lyandvert) and Lighting (Damien Cooper) are the simple, but talented, servants to the ordinariness of the contemporary ‘vibe’ of this rendition, in which extraordinary things are told. The flat visual choices of the production are in marked contrast to the bejewelled beauty of the writing by Mr Wright. Here is the gift to us. The language reminded me of the spectacle of hearing Wilde’s SALOME. The imagery and muscularity of verse structure is stunning and arresting. One longs to read it. (This is true of the “Troy” text too and THE LOST ECHO, I hope the STC plan to publish them). It is calamitous, then, that only a few of this Resident Company of actors have the verbal or physical measure or skill, of the writing that they are dealing with, for us. Ursula Mills, the leader of the chorus, Alice Ansara, Sophie Ross and Julia Ohannessian are not able to sustain the long verses of story telling in a consistently imaged or visceral manner to capture and keep hold of our imaginations or attention (Hence my SHINING dreams). And since the production has simplified the design images to such pragmatisms, the language as communicated sound is the vital gestural instrument of the experience. It mostly fails with these four actors. Mr Wright does not seem to be able to guide or assist these young artists to clarity or musicality (Voice and Text Coach, Charmian Gradwell). Long, arid staging of “noise” is at least half the night. Richard Pyros as Aegisthus (despite his silly costuming), Brett Stiller as Orestes are in stark but illuminating contrast to the chorus work above, moving and clear in their textual speaking. Relishing the language and the challenge of Mr Wright’s careful poetic crafting, word by beautiful word, phrase by phrase, and it was a blessed relief. However, for me, the pleasure of this production is to listen and watch the flowering of the gifts of Zindzi Okenyo as Clytemnestra. On the performance I saw, as the evening went on, Ms Okenyo grew from strength to strength to presage the promise of an actress of some greatness. It is not yet absolutely secure, but watching her over the year-long program that the Residents have shown us, the experience of this contract at the STC is nurturing a talent of some import. From the beautifully intelligent and skill supported creation of the small offer Of Lady MacDuff in Vs MACBETH to this Clytemnestra. True, a little too much bluster ( or nerves ) at the start it gradually settled down in the Agamemnon play to be in almost full possession in the second Libation Bearers act. Regal, arrogant and confidently foolish Clytemnestra. In the text, somewhere, one of the speakers talks of the “fledglings” struggling in the nest (in reference to Orestes and Electra, I think), it certainly gave me pause to think that the ‘nest’ of the Resident Company, after a year of opportunity, ought to follow the Darwinian inevitability, and cast some of these artists free – out of the nest – and to harness some of the others to further possible growth and flourishing soon. To invite some new energies. In the mid-seventies' Nimrod Theatre production of "The Oresteia"
Ralph Cotterill as Agamemnon made his entrance on stilts. Roaring , gleaming , he strutted about garbed in something like harem pants and a vest colored ochre and burnt orange. When Anna Volska as Elektra and Colin Friels as Orestes locked heads together , poised to strike like cheetahs with an eye on their prey , they also wore earthy colours. In the STC's version , Tahki Saul as Agamemnon enters through one of the three sets of elevator doors in the black back wall wearing a sports jacket and what may be chinos. The plainness of his dress is echoed in the outfits of the chorus: the three women are wearing a mix of pale ,silky slip dresses and in one case , a nightie. Cassandra hurtles onto the stage in seven inch heels. They're vivid , red perhaps - though how they don't seem quite the right gear for a seer. It is a testament to the talent of the actors that despite the crushing dreariness of the prevailing designs they manage in some cases to make outstanding contributions. Zindzi Okenyo comes on like Amazonian royalty , shooting fierce darts of defiance from a powerhouse bow. Brett Stiller as Orestes returns from battle , at once conveying the weight of his grievance , building his performance to a powerful climax. As Aegisthus , Richard Pyros survives a costume that looks like a relic from a hard night's Mardi Gras to register a snarling , violent heart. But the chorus presents problems . From the start one hears Aussie twangs in their invocations , and it jars. Unfortunately their combined efforts are not gripping enough to plunge us into the world of their griefs and needs. And they are occasionally hampered by infelicities in the text: when Clytemnestra at last lies dead from the thousand blows inflicted by Orestes , they have to cry : "Here we go again " . You might think that with the arrival of Apollo , there might be some transformation of the experience . After all , he's God of the Sun , surely well-connected , and reputed to have musical gifts . ( In the way of music all we have heard so far is some stretches of rather repetitive "Omm" sounds , the girls omming in high voices , the men in portentous bass.) Alas , Apollo is a thin figure with shaven head , dressed in close-to-the-body black suit with touches of dark gray ....he looks for all the blighted world like a recruiter for the Nazi party from some poor part of town. Cameron Goodall is precise and holds attention , but he can't lift us from our settled disappointment. If there was catharsis , then it was lost somewhere in my relief that the horror show was over.